As many business owners know, you can take all the precautions in the world and Mother Nature can somehow still find away to make a statement. And not just in the form of a natural disaster, but biologically, as well. 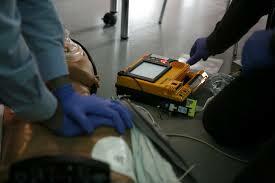 Cardiac arrest occurs over 10,000 times in the workplace per year. And although this is a rather low number, the fact remains, it can happen to your team, on your time. Having your staff trained in CPR and other emergency response procedures is strategic, as much as it is benevolent. In the event that an employee of yours goes into cardiac arrest, the precious moments until paramedics arrive are the gravest. Statistics show that there is a 5-7% survival rate when waiting for response. If another employee, a trained one, can practice CPR, eliminating the wait – you’ve just given someone a new lease on life. You’d also feel inclined to thank your lucky stars, because death at a workplace is a hard to shake off – emotionally and economically. Don’t gamble with your employee’s lives or your business. Virginia, Maryland, or D.C. area businesses can rely on The Heart Center Emergency Response Training & Simulation team for guidance. Visit our website or call (202)-536-7972 to register for classes, today!